Tis the season to begin thinking about all things holiday. Growing up in a French Canadian home meant one thing for Christmas Eve...meat pie. It just wasn't Christmas Eve without it (Tourtière, as it is called), eggnog, and eventually, midnight Mass. Slowly but surely, the pork pie tradition has been passed on to me. Ordinarily, as with most comfort food recipes, I would try and give it a healthy spin, but sometimes, you just have to keep it real. Some like it with potatoes, some without. Some serve it with cranberry sauce...some with a simple salad. And some with a big glass of eggnog. For all of my French Canadian family and friends, this is the recipe that was given to me, and one that has proven to be a keeper. Put the first 6 ingredients in a large pot over medium heat. Bring to a boil. Reduce the heat and stir the ingredients occasionally until they are cooked. Remove the liquid to another container to use later. Put the ingredients into a large mixer and process until the ingredients are well blended. They may also be mashed by hand, if a mixer is unavailable. Add the cinnamon, allspice, cloves, and salt and process until the spices are well incorporated. At this point, you may want to add some of the reserved cooking liquid. Add until the mixture is wet, but not soupy. Divide the mixture to fill the two deep dish pie shells. Moisten the edges of the shell with water and add the flat crust, pressing on the edges, so the top adheres to the bottom. Remove the excess crust and crimp with a fork. Pierce the top in a few places to allow for steam to escape. Bake at 350 for 30-45 minutes, or until the crust is golden brown and the center is heated through. What's something in your ethnic background that you love to share during the holidays? Hi Victoria! Thanks so much for the comment. Love your blog title. :-) I'm in MA too. This recipe is very doable. And it's delicious. I probably wouldn't try it if I had to make the crust myself, but with prepared crusts, you're good to go. Let me know how it turns out. :-) Cheers! He may not be a collector, but it sounds like he's a sentimental romantic...either way, he's a keeper. :-) Thanks so much for visiting! Happy holidays! It is my husband's background rather than mine, but I just posted my tourtiere. There are a few other French Canadian things I'm going to be posting. 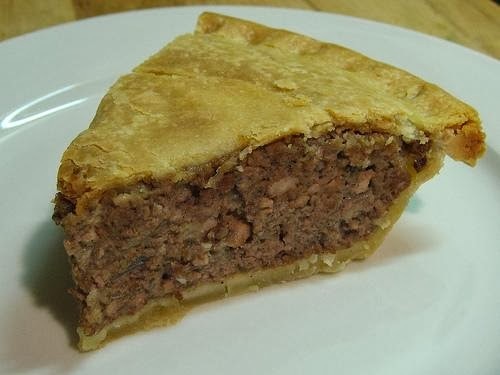 Thanks for sharing your tourtiere, Jean. I tweeted it. Merry Christmas to you! Thank you for stopping by!